Pictured here is the MOSSAR Color Guard team at two separate DAR Trail Marking Ceremonies taking place on October 30, 2010. The left photo took place at St. Charles, MO. The photo on the right took place at West Alton, MO. 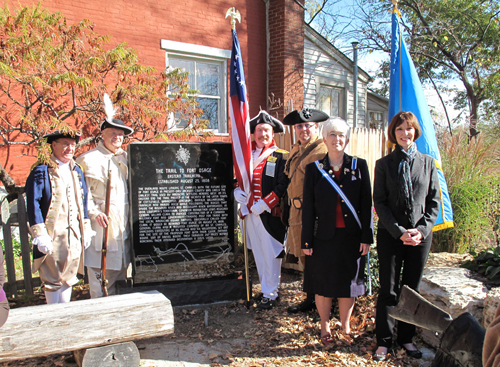 Left Photo (L-R): Compatriot Ed Morris, Compatriot Bill Groth, Compatriot Jim Jackson, Compatriot Jonathan Hunt, Lemira Parks, Past Missouri DAR Regent; and Patricia York, Mayor of St. Charles. 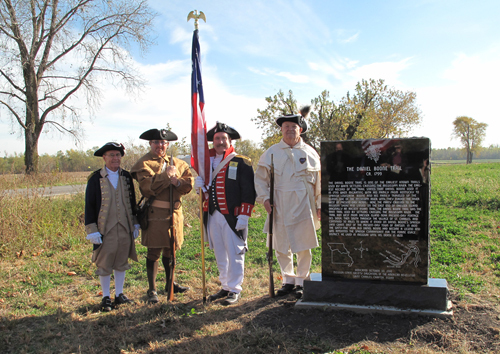 Right Photo (L-R): Compatriot Ed Morris; Compatriot Jonathan Hunt, Compatriot Jim Jackson, and Compatriot Bill Groth.